AUSTIN, Texas – No. 5 Texas Volleyball defeated Stephen F. Austin, 3-0 (25-14, 25-17, 25-21) to kick off the 2018 NCAA tournament at Gregory Gym on Thursday night. Texas advances to the 2nd rd and improves to 32-0 in NCAA 1st rd matches. Freshman Sydney Petersen and junior Claire Hahn led the Longhorns with double-digit digs. Petersen posted 17, also posting two assists, while Hahn finished with 12, also adding four assists and a team-high two aces. Three Longhorns recorded double-digit kills, led by freshman Logan Eggleston with a team-high 14 on 22 swings (.591). Junior Micaya White had 12 kills while senior Yassmeen Bedart-Ghani had 11 kills. White added eight digs and Bedart-Ghani added four digs and three blocks. Senior Morgan Johnson had six kills on 10 swings (.600) while adding three blocks and freshman Brionne Butler had five kills on 11 swings and led Texas with four blocks. Texas will play Texas State in the second round of the 2018 NCAA Tournament on Friday November 30th at 8 p.m. CT. The match will be televised on the Longhorn Network. AUSTIN, Texas – One of the best seasons in the history of SFA volleyball came to an end Thursday night at Gregory Gym as the Ladyjacks dropped a 3-0 decision to fifth-ranked Texas in the opening round of the NCAA Tournament. Senior Haley Coleman finished with a team-high seven terminations in her final collegiate match while junior middle blocker Danae Daron added five kills and a team-high three blocks for the Ladyjacks. Senior setter McKenzie Brewer registered two of SFA’s three service aces and junior setter Ann Hollas delivered a 16-assist, 11-dig double-double. SFA’s loss put an end to the nation’s longest winning streak. Headed into their opening round NCAA Tournament showdown against the Longhorns, the Ladyjacks had won their previous 29 matches dating back to Saturday, Sept. 1. • Thanks to some early errors by the nation’s fifth overall seed in the NCAA Tournament, the Ladyjacks got their hands on an early lead. • Texas committed a trio of unforced attack errors as well as a service error to help SFA jump out to a 6-3 lead on the nation’s biggest stage. McKenzie Brewer added one of her two service aces during that opening run for good measure. • The Ladyjacks’ lead, however, proved to be short lived. 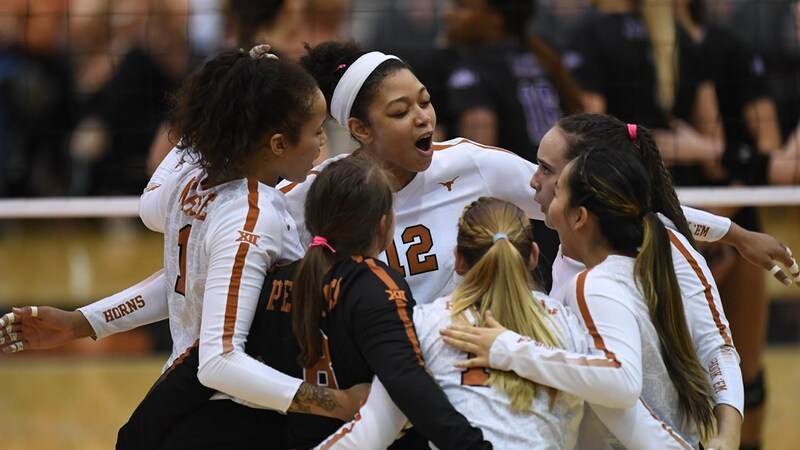 2018 Big 12 Player of the Year Micaya White and 2018 Big 12 Freshman of the Year Logan Eggleston each pounded down a pair of kills during a 7-2 run by the Longhorns that handed the home team a 10-8 lead. • Out of a media timeout after the Longhorns opened up a 15-9 lead, SFA used a kill and an ace from Coleman to fuel a 4-2 run that cut the Texas lead down to 17-13. • White took over for the Longhorns down the stretch, adding another trio of terminations during Texas’ 8-1 run to close out the frame. • The Longhorns totaled 17 terminations and hit .364 in the frame while SFA amassed only five kills. • Once again, the Ladyjacks were able to get the upper hand early on. Daron and Makenzee Hanna teamed up for a block on the set’s first point while Xariah Williams chipped in a kill to keep SFA ahead 2-1. • An 8-2 response from Texas, however, helped the home team take the lead for the rest of the set. White hammered down three more kills in that surge while Yaazie Bedart-ghani added another two. • Twice SFA managed to pull within three points but each time the Ladyjacks did so Texas answered with runs of 4-0 and 4-1 to regain control. • Texas hit .375 in the middle set and turned in 18 kills. For SFA, Xariah Williams powered down four of the the team’s nine kills in the set. • With their backs against the wall, the Ladyjacks again came out as the aggressors and claimed an early 6-4 lead behind kills from Daron, Makenzee Hanna and Hollas. • Anyia Williams’ lone termination of the set kept SFA in front 8-7 but Eggleston starred in a key stretch for the Longhorns that allowed the home team to jump in front for good. She finished with three kills in Texas’ 5-1 run that gave the Longhorns a 12-9 lead. • SFA continued to fight until the bitter end, cutting the Longhorns’ lead down to one point on two occasions. Consecutive kills from Hollas and Coleman made the Texas lead 18-17 before Texas went on a 5-1 run to take a 23-18 lead. • The Ladyjacks generated 12 of their 26 kills in the final frame and held the Longhorns to 14 kills on a .265 attack percentage. • SFA hit .063 in the match with Hollas providing team-highs in both assists and digs. Texas hit .336 – the highest single-match attack percentage by an SFA opponent in 2018 . • The Ladyjacks also saw their nation-leading 11-match winning streak in true road matches come to an end Thursday. Heading into their match against Texas, SFA was the only team in the nation that had not lost a true road match in 2018. • Brewer concluded her career on a great run from the service line. Through the last four matches, the senior turned in a total of 11 aces through 13 sets played which translated to an average of 0.85 aces per set. • Brewer, Coleman, Hanna and Peyton Redmond all played in their final matches in an SFA uniform. SFA’s four seniors helped the Ladyjacks return to the NCAA Tournament after a 12-year hiatus. • SFA established new program records for wins in a season (32), consecutive wins (29) and winning percentage in a season (.914) during its memorable 2018 campaign. • Eggleston put in a match-high 14 termination while hitting .591 for Texas. White added 12 kills while Bedart-Ghani finished with 11.